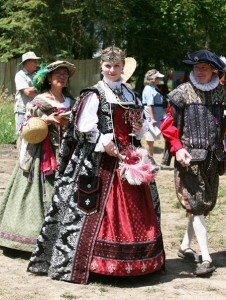 A queen and her court tour the Canterbury Faire. Geoffrey Chaucer would be right at home with his Canterbury Tales at the fifth annual Canterbury Renaissance Faire in Silverton with jousting, sword fighting, food and drink and the Queen and her court in 16th century period costumes. This year’s faire is July 20, 21, 27 and 28. The faire is held on six acres on the Old Mount Angel Highway just north of Pine Street. In addition to the jousting and sword fights, there will be merchant craftsmen, a marketplace, kids’ games, an ale yard, food court and an archery tournament open to the public. A blacksmith will demonstrate how armor was hand hammered and there will be period weapons for sale, along with other crafts and arts. White said her daughter Abigail White is her right hand and general assistant and her daughter Alison White plays Queen Elizabeth in costume and rules over her court of volunteers. “Alison performs with the kids teaching them court protocol, how to bow and courtesy,” White said. Mike Reife is site manager for the faire. “Mike helped start the faire when he took Abigail to a renaissance show in Kings Valley near Dallas several years ago and I had been trying to come up with an idea for a show here. Abigail gave me the idea,” White said. White’s sisters, Barbara and Linda Windus, work the entry booth. Tom and Andrea Montgomery come up from California. Steve Glindmeier, a Silverton CPA, is heavily involved in the faire yearround as the computer expert, tax manager and bookkeeper. “Steve is indispensable. I don’t know what we would do without him,” White said. “It boggles my mind that we have so many people who give so much and no one gets paid. During the faire, we must have hundreds of volunteers helping out. The jousting events, held every day of the faire, conform with White’s career as a horse trainer and riding instructor. “I got my first horse when I was seven. I guess I’ve always had the bug for horses,” she said. She went to the Pacific Horse Center in Sacramento, Calif., and became certified as a trainer and instructor in 1975. She bought acreage on Old Mount Angel Highway in 1981 and began training horse for clients in the Silverton area and teaching riding. Now with the annual event, she has the opportunity to take guests back-in-time and teach them about another place and time. To see schedule and more, visit www.canterburyfaire.com.